Recording music can take many different forms, ranging from a simple-but-effective handheld two-channel live recording to a full digital studio setup with multi-channel desk, acoustic treatment and effects. Absolute Music has all the best recording equipment that you could need to get you up and running with a recording solution to suit your requirements. 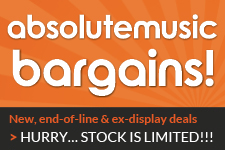 Be sure to check out our range of the best multi-track recorders, mixing desks, headphones and monitors below. There are many factors that can impact the recorded sound in a studio, so to get the best possible recording environment we recommend using a high quality microphone (we can’t speak more highly of those made by Sontronics, sE, Rode and of course Shure), some acoustic treatment, a decent preamp and a set of monitors and headphones to listen to your creation with precise clarity and accuracy. All of these, and more, are available to buy online or in-store from Absolute Music today.